Oh My Goddess! Colors is Dark Horse's English-language edition of a special collection first published in Japan. 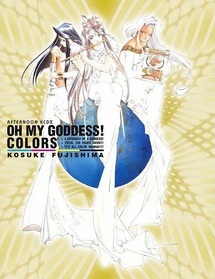 Original publisher Kodansha, working with artist Kosuke Fujishima, produced color versions of four of the best-loved stories from the series, each centering on one of the goddesses. "The Number You Have Dialed Is Incorrect" is the one which started it all, as Belldandy appears when Keiichi reaches The Goddess Technical Help Line. Belldandy's big sister Urd becomes small in "Urd's Fantastic Adventure," and in "Crazy Little Thing Called Love," Skuld, the youngest of the sisters, wobbles through her first romance while learning to ride a bicycle. Finally, "Are You Being Served?" brings in the Fourth Goddess, the vampish Peorth, when Keiichi misdials again to reach Belldandy's rival agency... the Earth Assistance Hotline! Published in the original Japanese format!